Jan on the Âu Cơ as the boat docks for Cát Bà Island. 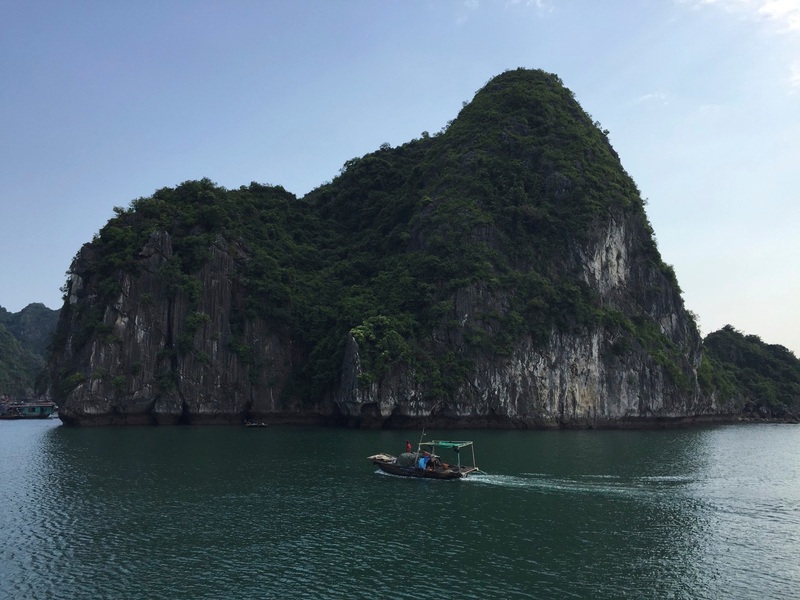 My last post ended with our Hạ Long Bay boat docking at Cát Bà Island. In English, Cát Bà translates to Women’s Island. 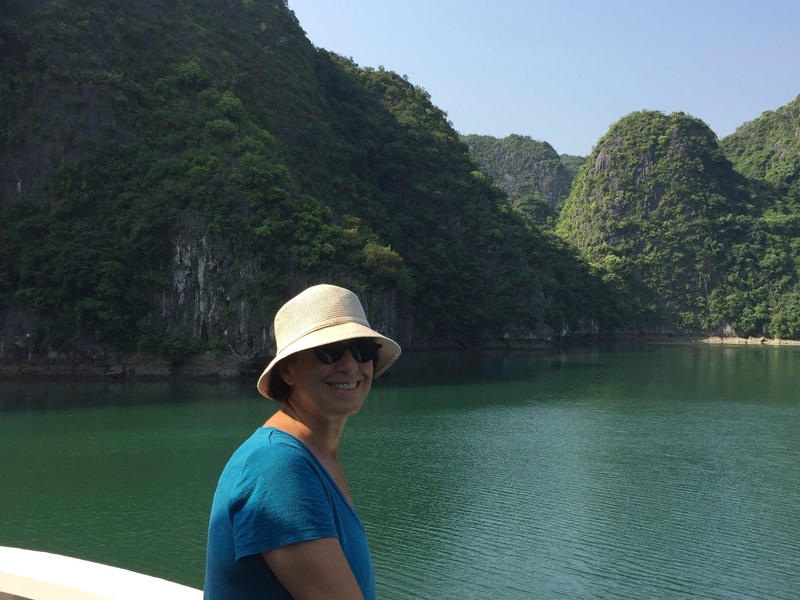 As Jan and I prepared to disembark, we reflected quietly about the extraordinary role of women in Việt Nam’s history. Reaching back centuries, female military leadership against Chinese invaders remains embedded in the collective national unconscious. Việt Nam’s story about women strikes us as unique, and might well be one of the most compelling of any country on earth. You question women in the military as armed combatants? Are you kidding me? 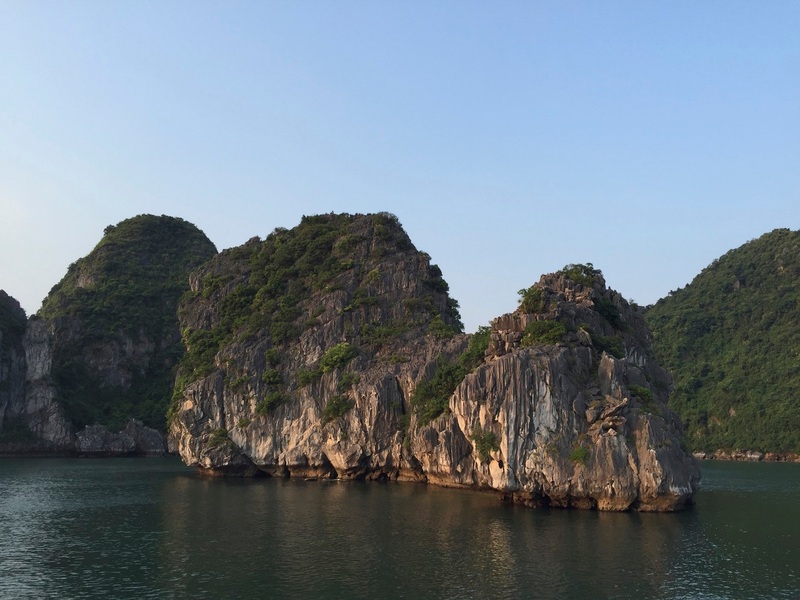 Before I continue with my tour of Hạ Long Bay and Cát Bà Island, a brief thumbnail introduction to Women’s Island might be helpful. 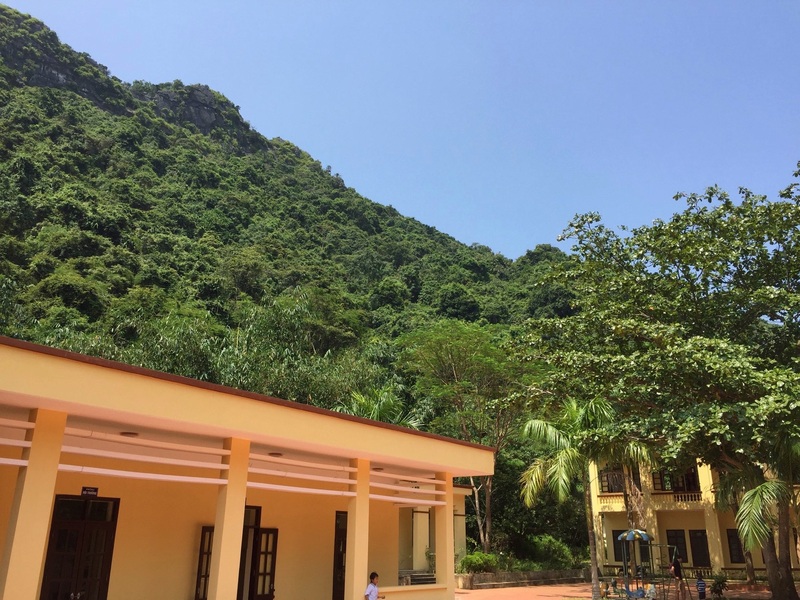 After all, our 2016 autumn in Việt Nam was about finding the genuine Việt Nam, a country and culture unto itself that is not a property of China, or Japan, or France, or a simplistic communist idea America fought in a far off place and didn’t win or didn’t lose, depending on your definition of stubborn. 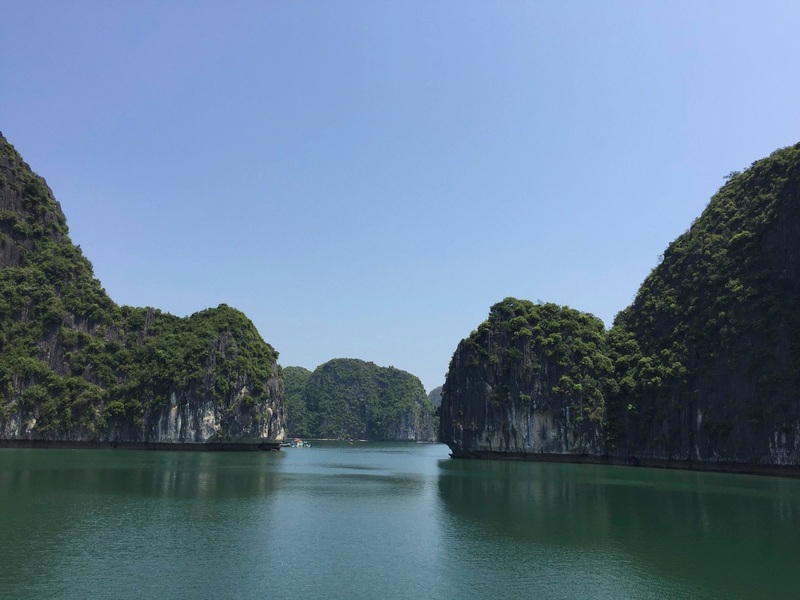 And you’d be right to expect that Hạ Long Bay has a lot to do with Việt Nam’s national heritage. 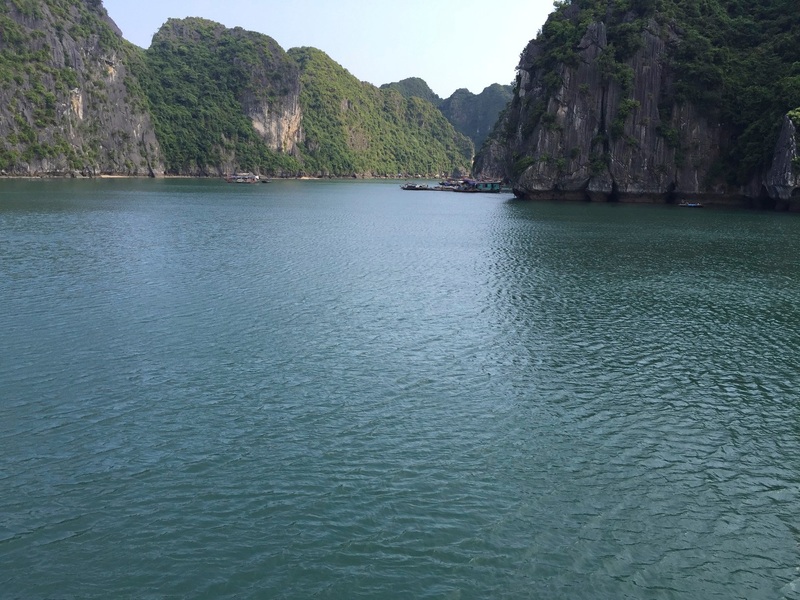 Việt Nam’s identity is forged in Hạ Long Bay. The Chinese assert an almost continuous colonization of Việt Nam from 111 BC to 938 AD. Before this 1,000 year era of Han Chinese cultural superiority, Việt Nam was a unique and dominantly matriarchal society. The Chinese would change all that. But in 40 AD the Trưng sisters, Trưng Trắc and Trưng Nghị, led a military revolt against the Han Chinese invaders. 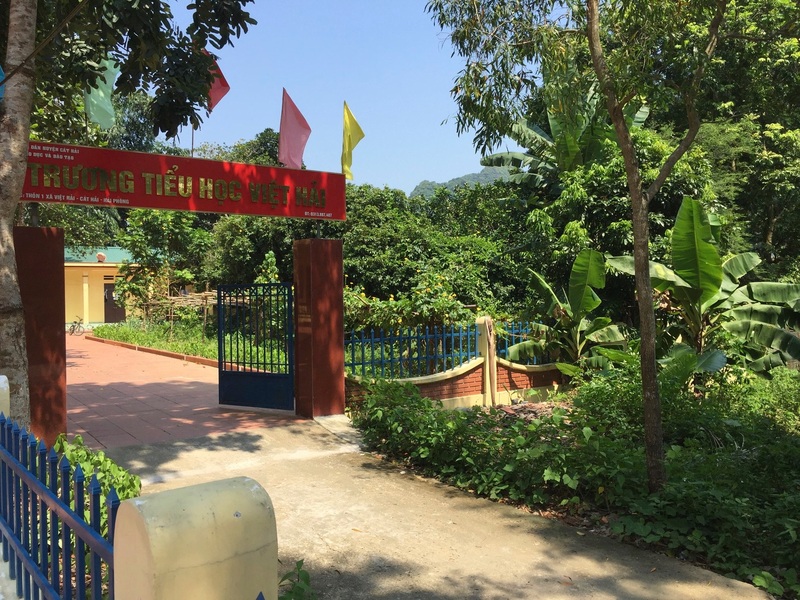 The Trưng Sisters are revered to this day as national heroines of Việt Nam, as their three years of successful rebellion inspired hope of eventually overthrowing the Chinese permanently. Perhaps this distant memory now rests in a national unconscious, but it is in the Vietnamese resentment DNA that the Chinese upended their strong matriarchal society by introducing Confucian patriarchy. So is Việt Nam matriarchy or patriarchy? Both simultaneously? I never said understanding Việt Nam was easy. For starters, coastal Việt Nam is settled from Fujian in China, by the Trần Clan. 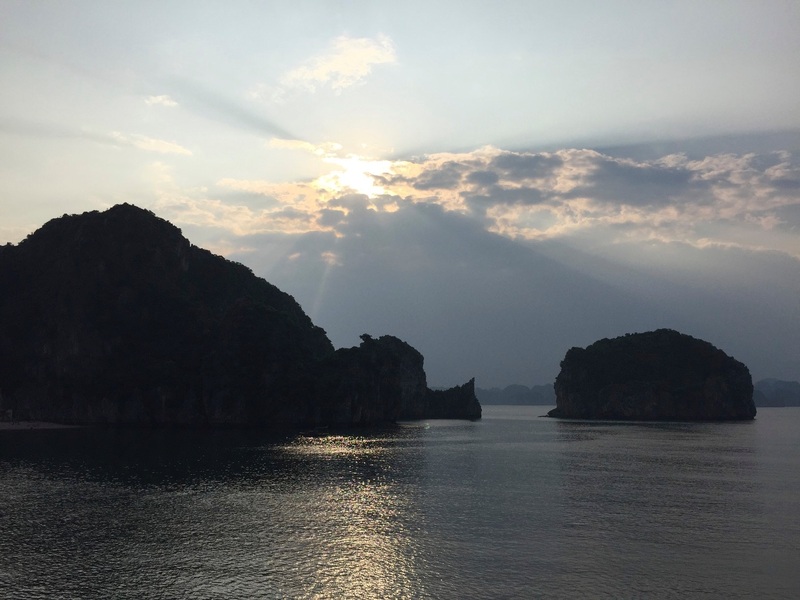 You can probably see what’s coming and why Cát Bà Island in Hạ Long Bay is so powerfully symbolic for the Vietnamese. Legend has it that three women were murdered by the Chinese during the Trần Dynasty, which rules Việt Nam from 1228 to 1400. 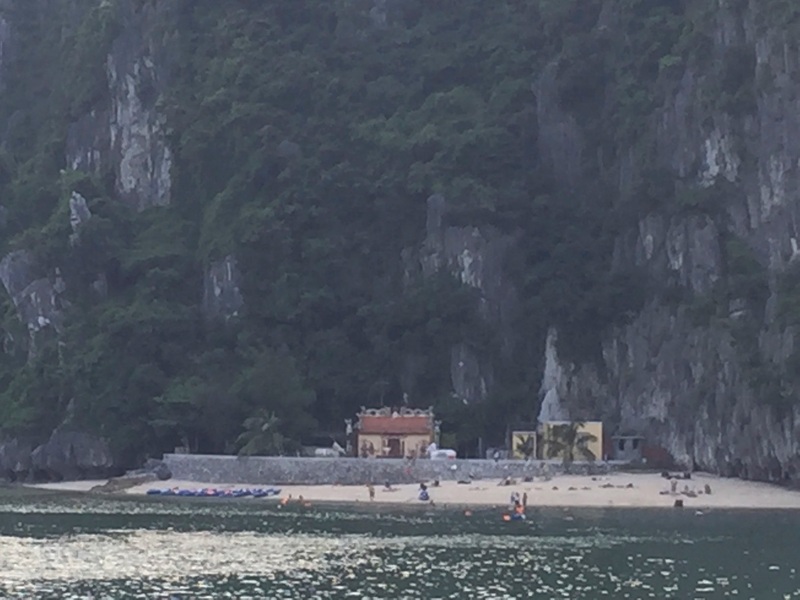 Each corpse floats onto different areas of a sandy island in Hạ Long Bay. Cát means sandy and bà means woman. 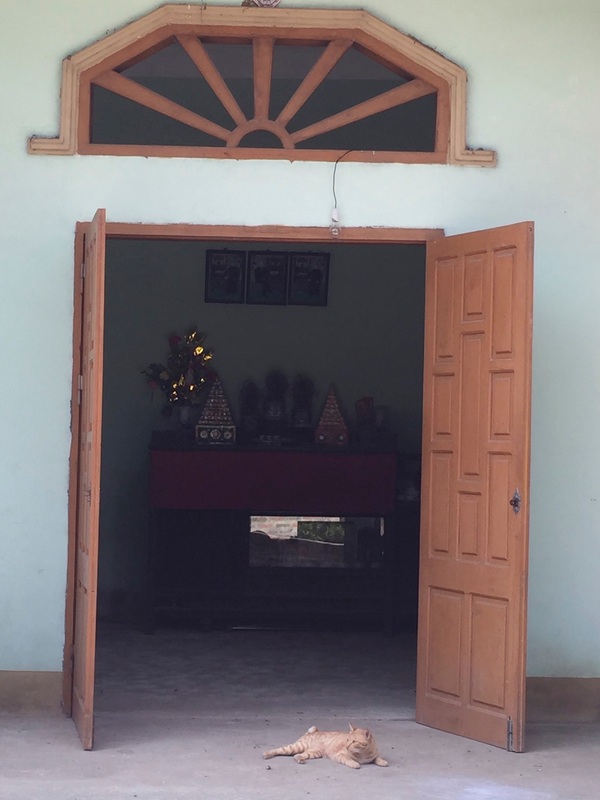 The island inhabitants built Buddhist temples for protection to acknowledge the souls of these dead women, and there was increased resolve to defend against foreign invasion on what became Women’s Island. As always, the Chinese are the main culprits, a theme with many historical variations in Việt Nam. 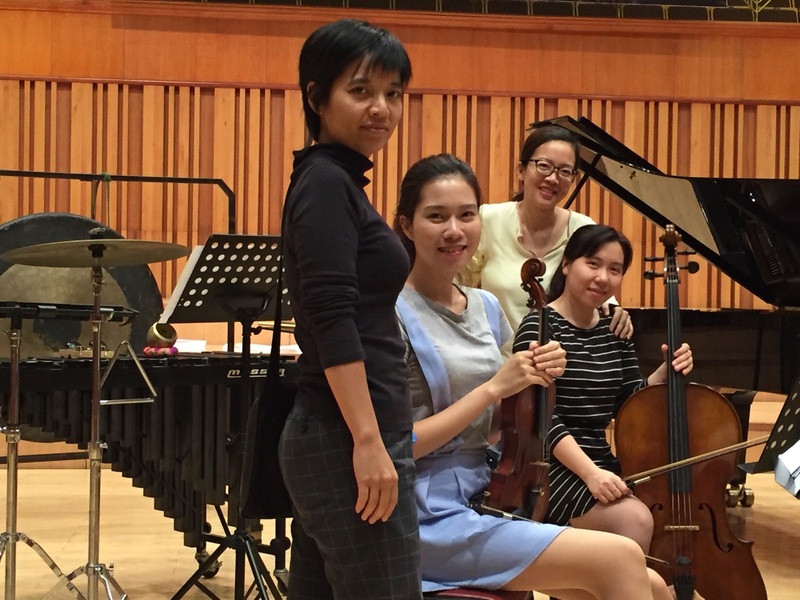 Composer Trần Kim Ngọc, violinist Vũ Khánh Linh, cellist Giang Dương and pianist Tam Ngọc Trần of the Hà Nội New Music Ensemble. Let me now start by pointing out something obvious, the name Trần, which you’ll encounter often in Việt Nam. To make my point personal, there are two Trần’s, found in various nominal positions, in the photo of my Hà Nội New Music Ensemble members pictured above. Because something definitive for Việt Nam occurs during the Trần Dynasty, which spans 1225 to 1400 and represents the defining cultural distinction of independence from China. Emperor Trần Nhân Tông begins using the Vietnamese language for official documents for the first time. 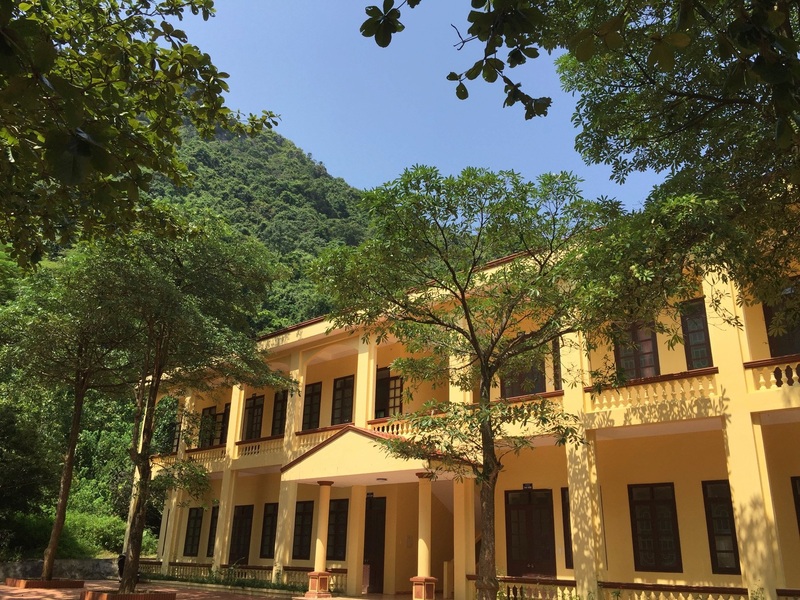 By 1282 poet Hàn Thuyên, Việt Nam’s Dante, records the first written poem in Nôm calligraphy, pioneering what will become the Vietnamese language, its poetry and its literature. Being poetic defines being Vietnamese, and that means being free of Chinese invaders. 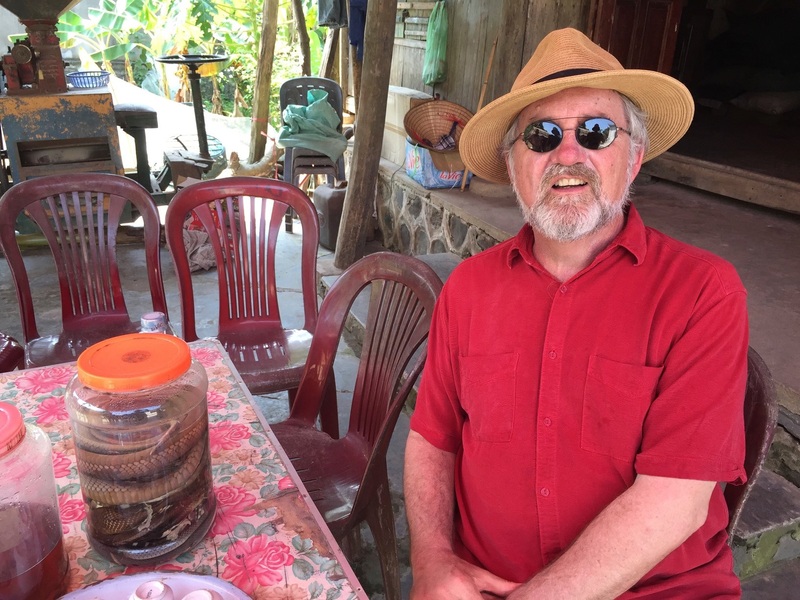 So if Trần is in your name, you’re packing considerable poetic wallop and asserting your Vietnamese bona fides. The road onto Cát Bà Island. So with this brief introduction concluded, let’s get into a skiff boat and get onto Cát Bà itself! 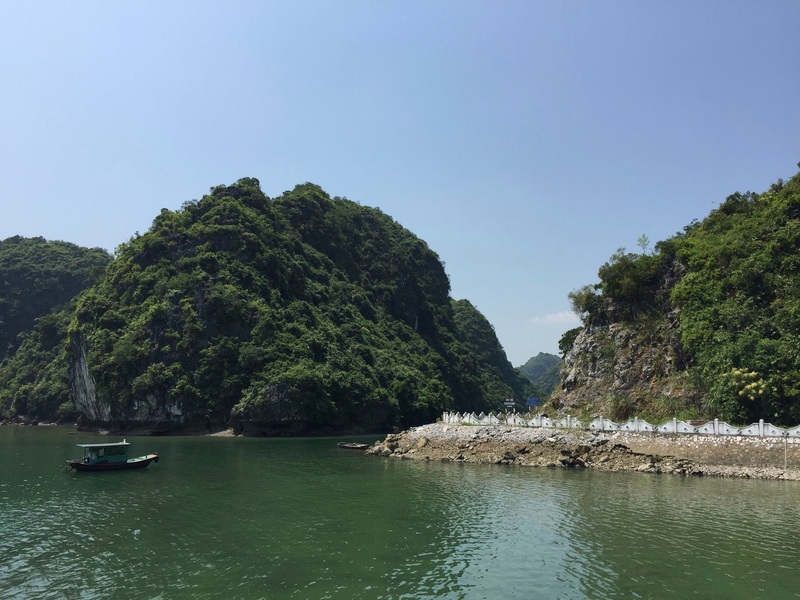 This morning Women’s Island hike is a great introduction to Cát Bà, and the Âu Cơ lands you in a quiet spot away from tourist noise. I’m planning on returning to Cát Bà, which is partially a national park, next trip and spending a lot more time. 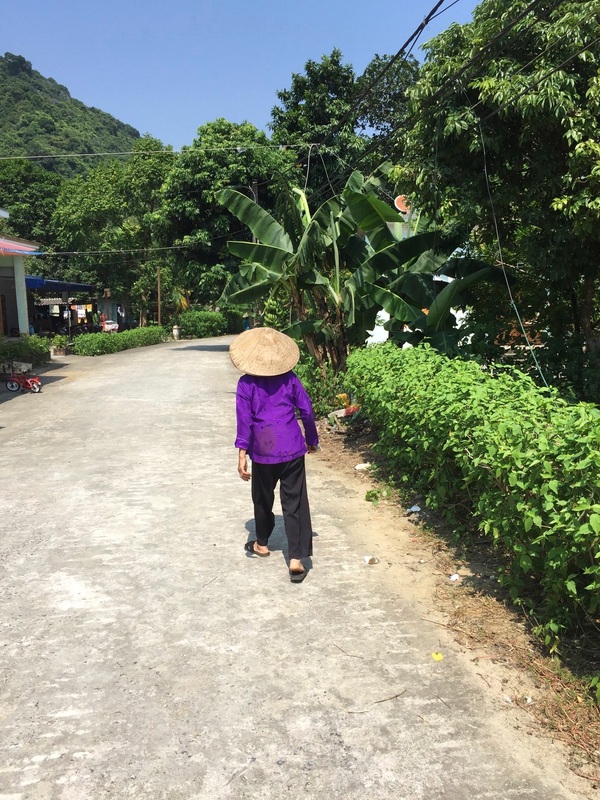 A woman leading me forward on Cát Bà Island. 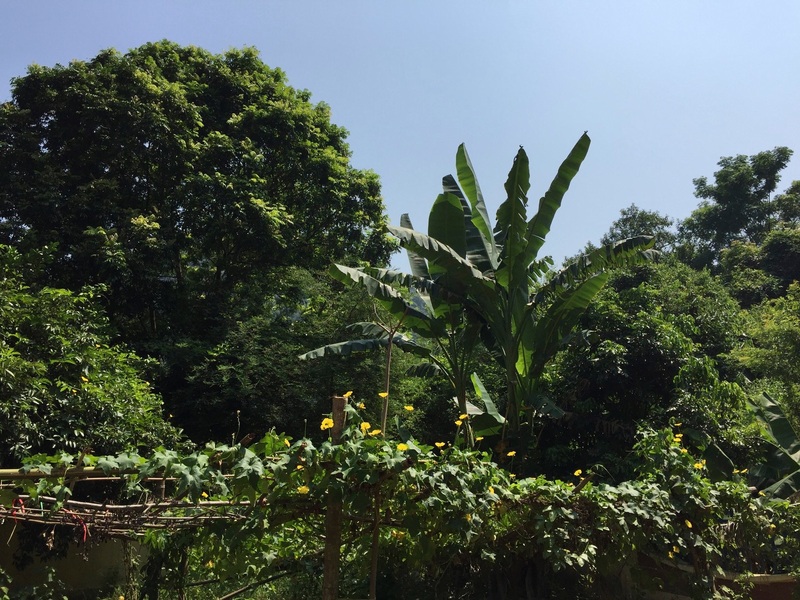 There is a small village on this part of the large island, with a few shops and lunch, beautiful banana trees and farm land galore. You can bike, hike, and trek into the forest. Jan and I chose to stroll the length of the village with the time available. Stop for a taste! 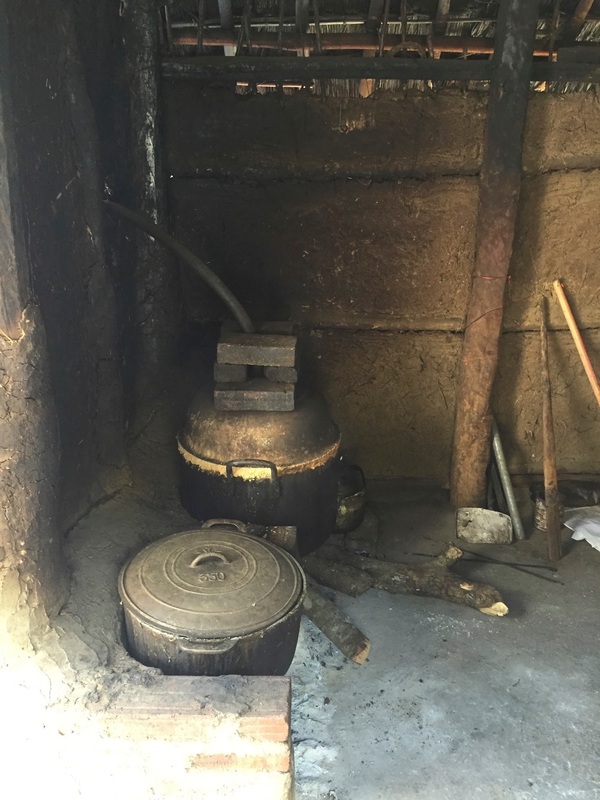 A still for snake grappa on Cát Bà Island. The firewater of snake cognac is clean and refreshing. Take a chance! A lazy cat in front the front door of a family. 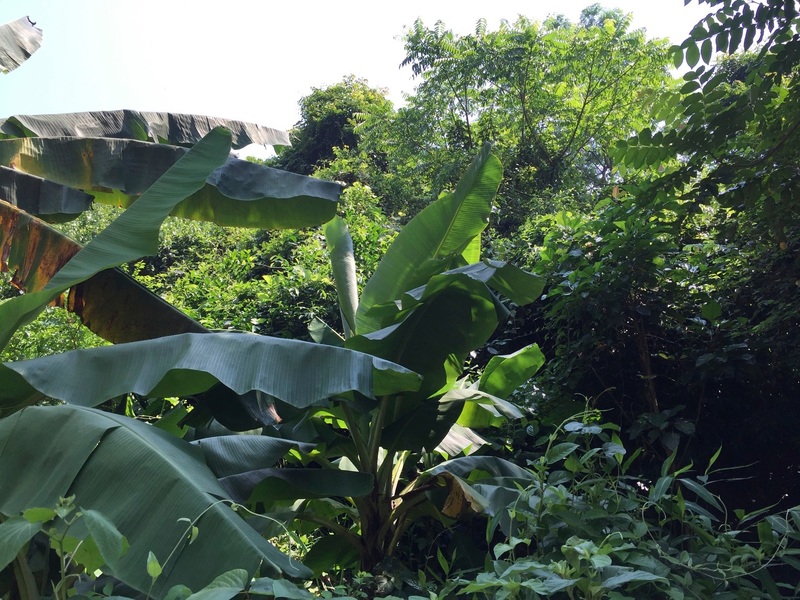 Endless vegetation on all sides. At the end of the village is an impressive and charming elementary school, with its French inspired color scheme surrounded by lush jungle. A world of deep green. 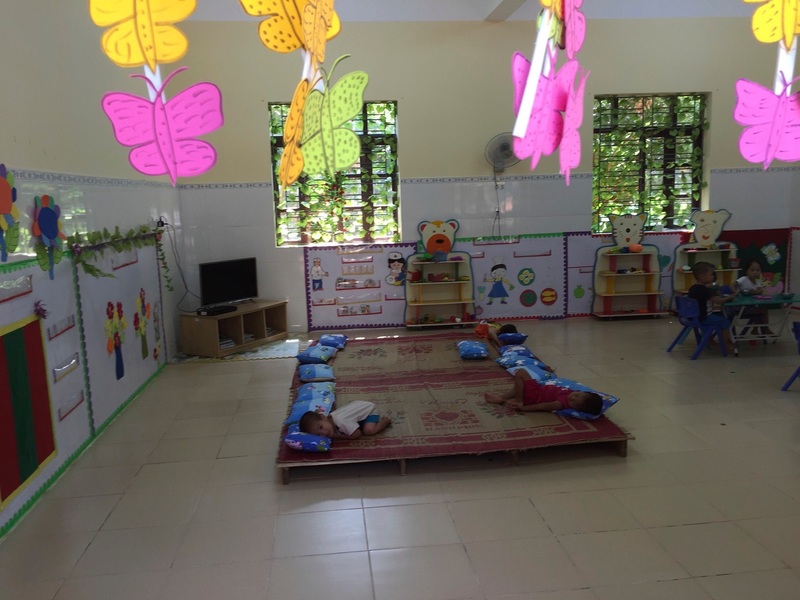 Việt Nam’s next generation of leaders ready for their naps. We retraced our steps to return to a short drive back to the landing area and return to the boat. It was time to shove off during lunch, with incredible vistas until we arrived at our next stop, a small isolated cove with chances for kayaking and swimming. I’ll let a photo gallery give you an idea. 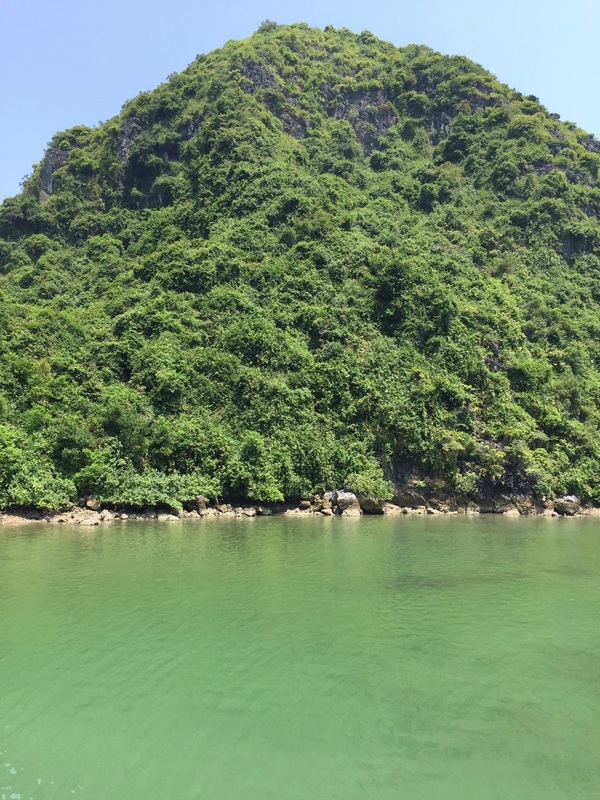 The green water of noon surrounds Cát Bà Island. 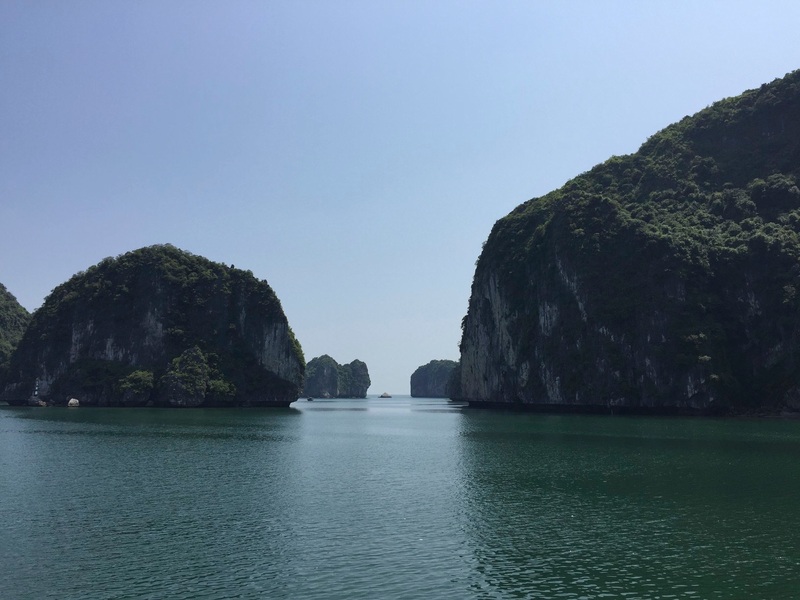 Going back out into Hạ Long Bay. Karst rock up close amid deep green water. 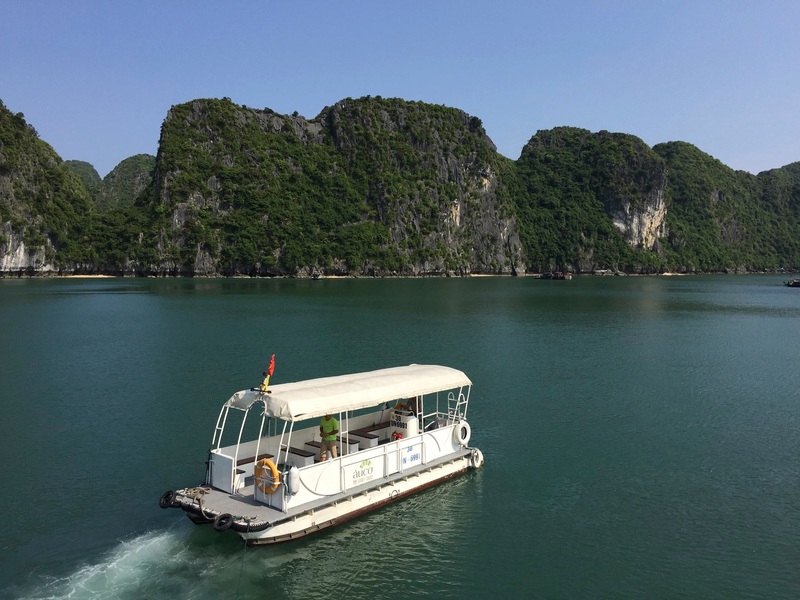 So while lunch is being served you’re cruising on more of Hạ Long Bay. Eventually, you come to a beautiful spot, surrounded by a few boats but nothing tourist heavy. 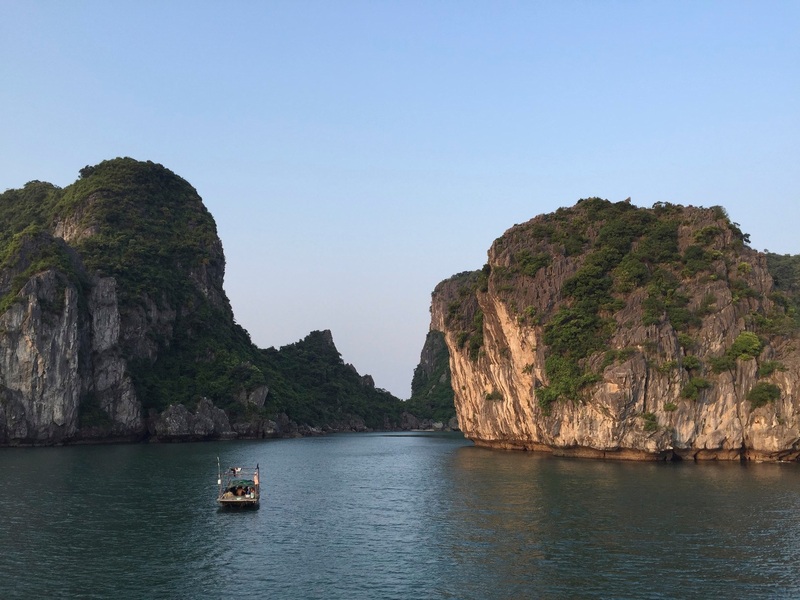 The Âu Cơ casts anchor, and I’m ready to enjoy the light and quiet of the boat as many take the opportunity to kayak and swim on a close by strip of sand beach at an old French colonial outpost. 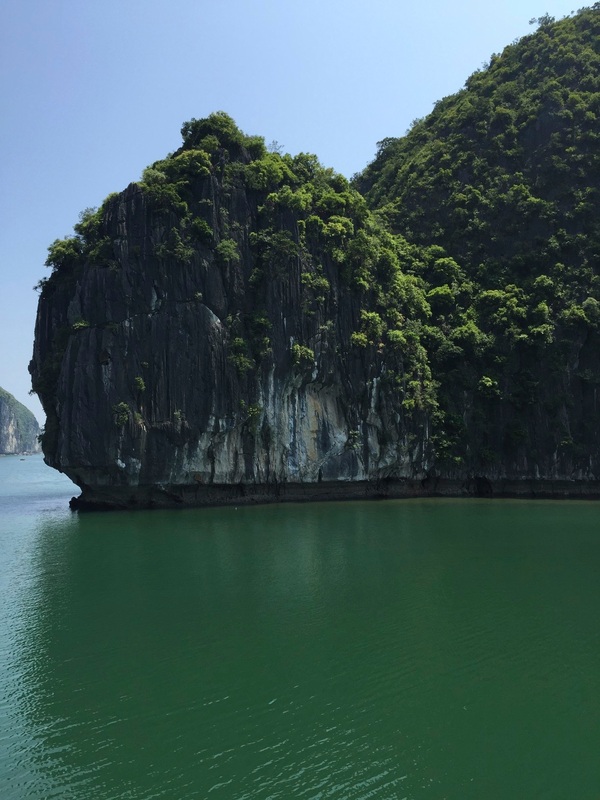 This is my chance to channel my inner traveler, to completely slow down and and gaze in silent calm at Hạ Long Bay for a few undisturbed hours. The view to my right. A zoomed shot of the swimming beach. And then, after all have returned from kayaking and swimming, the anchor is raised, the engines begin to purr and my best hope becomes reality. 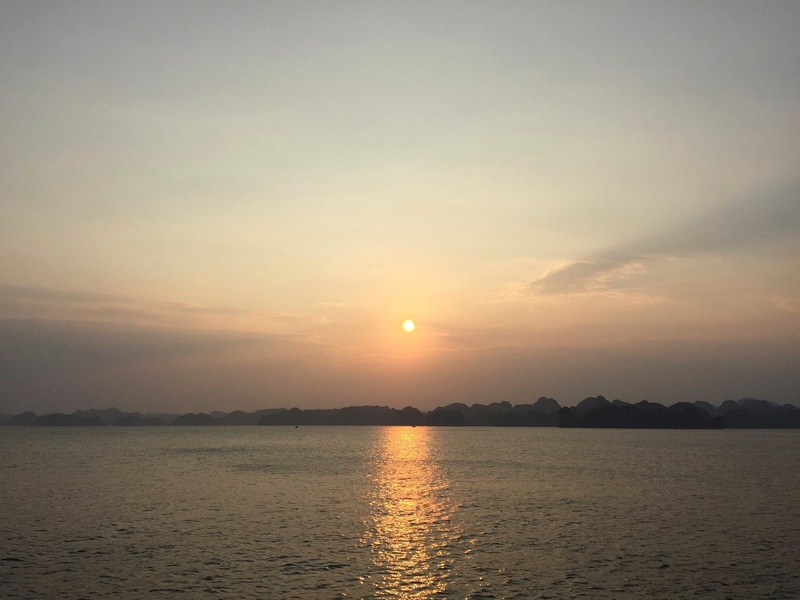 A gorgeous sunset is beginning as we set sail for a tranquil twilight journey to our second night’s stay. Twilight sun on the karst cliffs. A small boat heads into an inner passage. 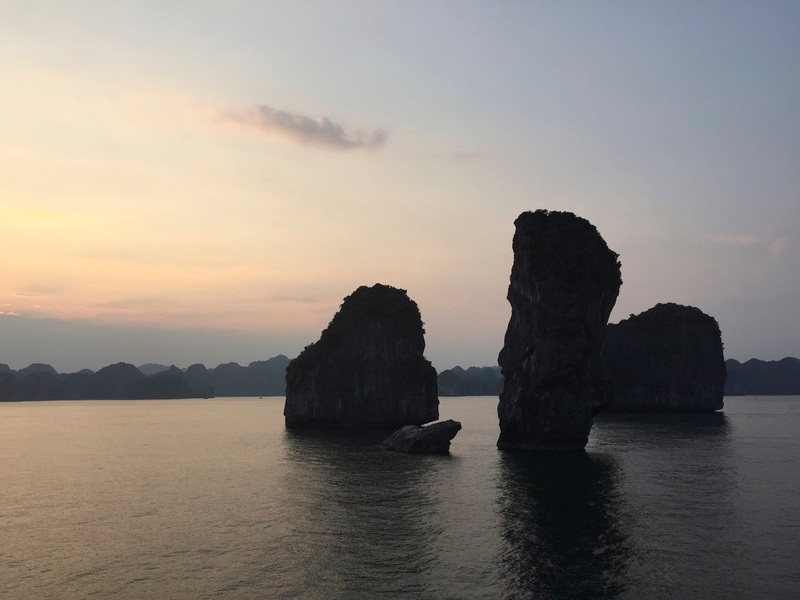 An expansive Hạ Long Bay sunset. Imposing rock formations beautifully illuminated as night approaches. As night falls, my eyes are filled to capacity, losing the light of the day is almost a relief so that memory can take over and replay the endless poetry of a place that cannot be explained. 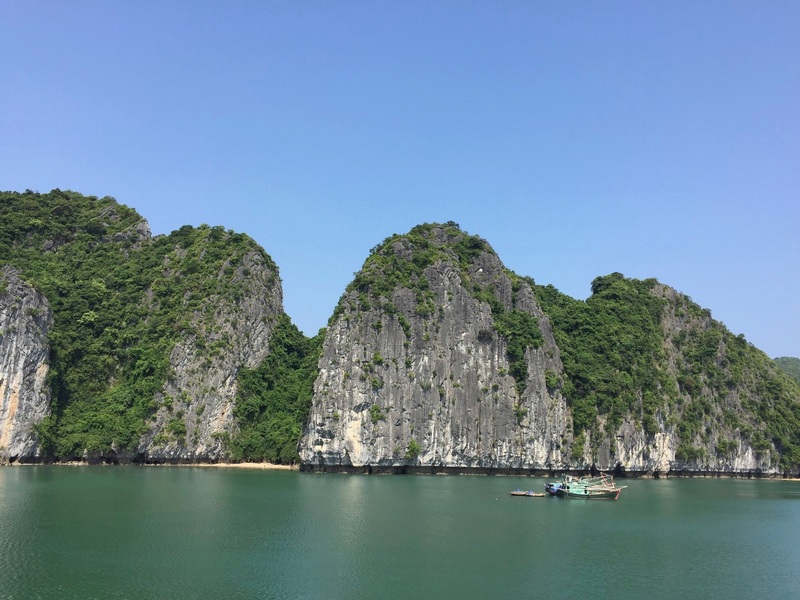 My next post will continue on Hạ Long Bay, as we go into one of the many magical caves that can be found here. 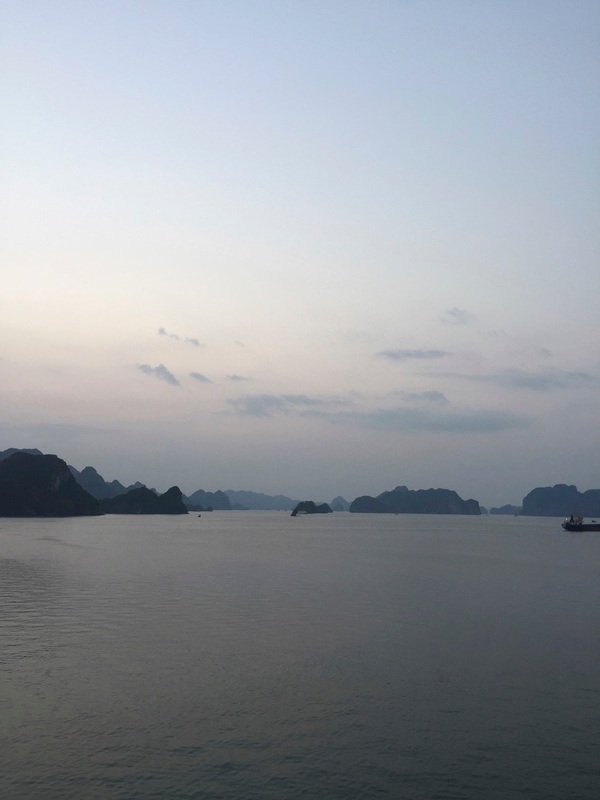 Night falls on the descending dragon, protecting all of Việt Nam from foreign invaders. 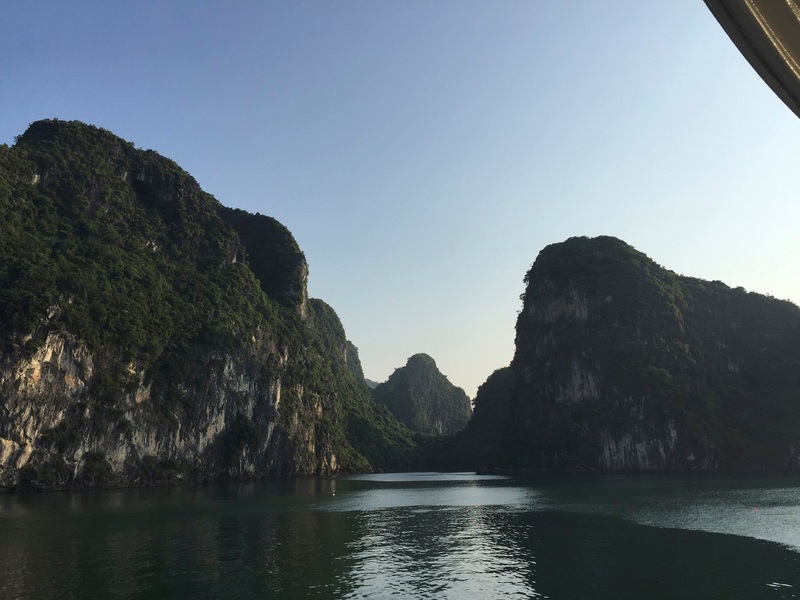 Hạ Long Bay, where the Vietnamese people claim their origin. No wonder they survive!